Ambassador to Japan Aart Jacobi present, JAXA Vice President Hitoshi Kuninaka and SRON Director Rens Waters signed the joint statement at Embassy of the Kingdom of the Netherlands in Tokyo. design of missions for future implementation, and development of critical technology for future missions. JAXA and SRON have developed the relationship over a long time in space science. Releasing this statement will enhance and accelerate the cooperation. 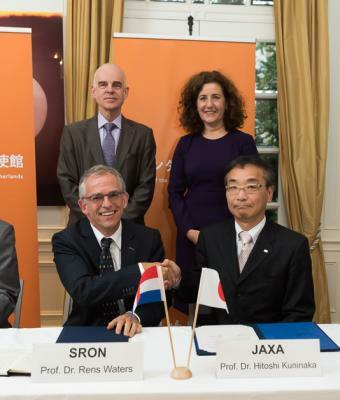 From the dawn of X-ray astronomy, the Netherlands and Japan shared a long history of cooperation. Cooperating in a wide range of field in space science will bring about fruitful scientific results.